I have a generated PDF with precise dimensions. I verified the dimensions in Preview. When printing on my HP Officejet Pro 276dw I cannot get it on the paper with the same dimensions. When choosing "A4" I get it scaled down too much. When choosing "A4 borderless" I get it scaled up too much. The PDF is in A4 dimensions without a crop edge. Is there any way to force printing directly as-is? A4 at 100% is reduced slightly (about 98%), but placed at the correct height on the paper. A4 at 102% is slightly enlarged, and placed about 2mm too high on the paper. A4 Borderless at 100% is enlarged just slighly an placed about 5 mm. too high on the paper. Ok, I read your question, I have read your comment on @user2236575 answer. Still I am going to point you in the same direction. Open your PDF in Preview. Print this PDF with the instructions above. Test your print like this if you do not have got a ruler. An A4 size 29,7cm long and 21,0cm wide. Overlay the wide side of an A4 paper over your ruler, it will measure 21cm exactly. If not, you did print it correctly, but your printer does something wrong or overwrites these settings. I encounter similar problems with my Brother MFC-J6920DW. When you print a document it (longest side) will be reduced to fit within a 3 mm 'virtual' border. For A4 this results in a 98% print. When you print a document with 'borderless' paper settings it will be first scaled up until it has a 3 mm bleed (again, longest side). For A4 this is 102%. For A3 paper these percentages are slightly smaller because the 3+3 mm = 6 mm : 420 mm (longest side of the A3 paper) is less than with the 6 : 297 mm of the A4 paper. It's about 1,428 percent instead of the A4's 2,020 percent. I spend quite a few hours trying to find a way to fix this, but I'm afraid it's written into the printer's firmware, at least in the Brothers MFC's and I suspect HP is using the same trick, or at least with the borderless option selected. Please let know if this works for you too: The easiest solution is - oddly enough - to scale back to 98% so it will then print borderless at 100%. In Preview's print dialog you should have the option to 'Scale' (as opposed to 'Scale to Fit'. If you select 'Scale' then you can key in 100% as the scaling percentage, and the image should print full size. I can't comment on the specifics of your named printer, as I don't use that machine. You are printing to a mechanical device that isn't 100% precise, it doesn't pull the sheet through exactly square, it doesn't pull the sheet through consistently the same, it requires a non-printing feeder edge(s), or it's just a low-down crumby printer! a. finesse your original file to fit the limitations of your printer. My recommendation is to place your pdf in Indesign, print a sample sheet, and then tweak the position and scale in InDesign. Repeat until satisfied. b. print to a high end printer on a bigger sheet and cut it to the finished size. It sounds like the printer has trouble with edge to edge printing or is confused about the paper size that is installed (possibly indicated by a shifted image). In my experience it is common to have to print edge to edge jobs on a paper size that is larger than the document size and then trim the paper. Make sure that your paper tray guides are right on the A4 settings. Printers normally judge the paper size from those guides and if they are a bit off it can be confused about what kind of paper it is printing to. See if you get the same behavior with Adobe Acrobat (maybe trying "print as image" under the advanced settings). Use a larger size paper (A3, A2) and then trim the print to A4 if needed. Not the answer you're looking for? Browse other questions tagged pdf printing . How can I print a booklet from a pdf file? how to print or export annotations in a pdf file? 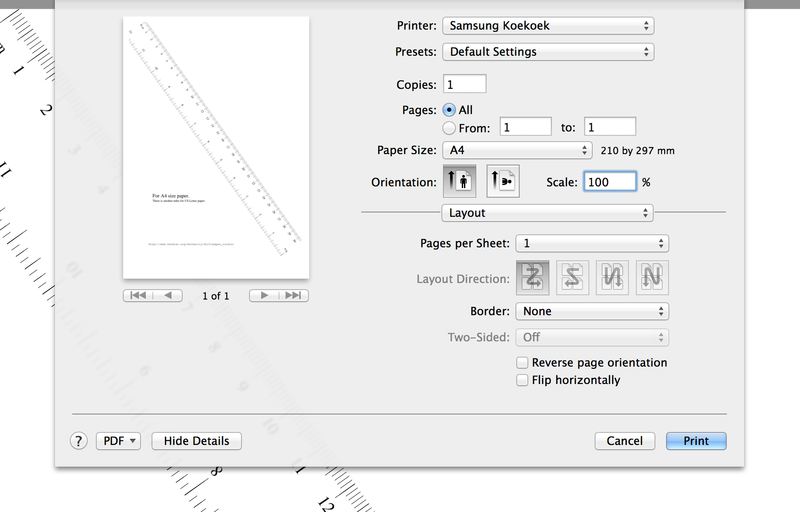 How can I print a PDF/X Mavericks document?